The person responsible for a building or site is legally required to maintain all fire fighting equipment, including dry risers. It is important to have a valid certificate of compliance in place to demonstrated that the dry riser inspections, testing and servicing has been carried out correctly and in accordance with the regulations. BS 9990 outlines recommendations for testing and maintenance of wet and dry fire-fighting mains. When is testing required on Dry Risers? 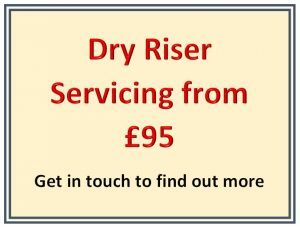 The 2015 British Standards BS9990 requires a full annual pressure test and six monthly visual check for dry risers for buildings above 18 metres and below 60 metres (buildings over 60 metres/18 storeys require wet risers). Dry risers require a visual inspection every 6 months. This dry visual inspection is important to check for obvious signs of damage or vandalism and so ensure that they are in good working order. Pressure test – where the dry riser is filled with water at a given pressure for a period of time. During this pressure test all inlets and outlets are checked for leaks. Flow Test – to ensure that when jets are in operation a suitable running pressure is still available within the system. This ensure that there are no blockages in the system. Any faulty or damaged parts are replaced and the testing is repeated before issuing the certificate of compliance. Ultrasafe offer a full testing and maintenance service for all dry risers throughout the UK. Our experienced engineers carry a large inventory of spares to ensure that all work is carried out promptly and efficiently. Please get in touch to discuss details, get free quote and book testing.